It’s a bird! It’s a pile of trash! It’s…a bird made out of a pile of trash? Plastic pollution is a growing threat to our ocean, with an estimated eight million metric tons of plastic waste flowing from land into the ocean every year. This means that by 2025 there could be one ton of plastic for every three tons of fish! And there’s much more to the problem than floating bags, bottles and fishing nets—as many as 51 trillion pieces of microplastic (plastic pieces less than five mm) now circulate in the ocean. Every day, all over the world, concerned people take the problem into their own hands by cleaning up their local waterways. 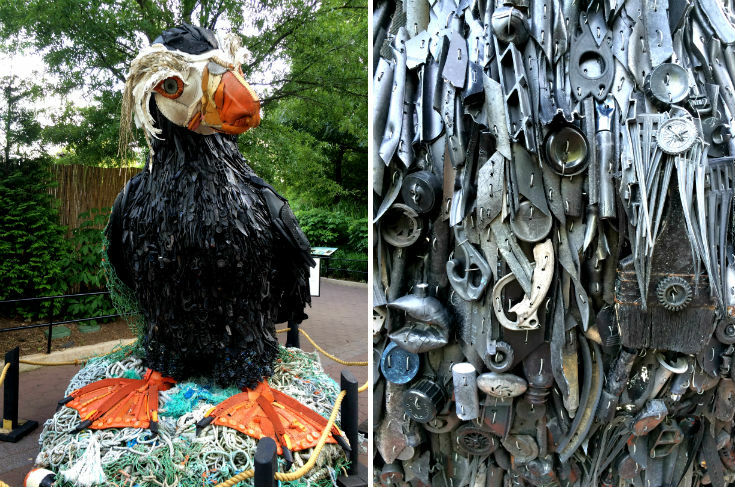 This summer, the National Zoo in Washington, D.C. has developed a unique method of displaying the collected debris and raising awareness about the problem of ocean trash. Washed Ashore: Art of Save the Sea is a massive exhibit featuring 17 sculptures of marine critters made of plastic pollution. From a polystyrene foam coral reef to a jellyfish made of plastic bottles, the pieces are eye-catching, beautifully intricate and entirely made of trash collected by volunteers from waterways around the world. Developed by the Washed Ashore Project, the main goals are to educate viewers about plastic pollution, challenge them to change their consumer habits and even inspire them to participate in a cleanup. Ocean Conservancy is committed to keeping our beaches and ocean trash free. For 30 years we have sponsored the International Coastal Cleanup, where 11.5 million volunteers from 153 countries have collected 220 million pounds of trash. These efforts, combined with other creative approaches to tackling plastic pollution like the Washed Ashore exhibit, help us work towards a healthier, trash-free ocean. If you’re in the Washington, DC area, you can see the exhibit for yourself! The free exhibit is open every day from May 27 to September 5 during National Zoo hours. Hope to see you there!